« A Brand New “Timber: United States Marshal” Adventure From Robert Hanlon Arrives In Town! It was announced earlier this week that Outlaws Publishing would be awarding Dave Sebeslav with a sales certificate to celebrate the success of his latest Western. “A Long Way To Texas” is now one of the biggest sellers in the United States. Sebeslav has three other novels on the bestseller chart too at this time. 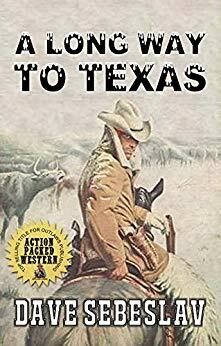 “A Long Way To Texas” tells the story of a restless and lonely Civil War veteran, Jake Christie, who leaves the family business in Springfield to venture westward, where relatives have settled on the Texas plains. On the way, he makes friends and enemies. Once there, he finds danger and the love of his life. This epic adventure has caught the attention of Western fans from around the world. “Our hit squad leads the way,” Outlaws President J.C. Hulsey explained. “Readers are scouring the internet, searching new Western authors. We have a duty as a company to find the best writers with the greatest stories for our readers. We strongly believe that Kammen, Allen and Bailey will be the hitmakers of tomorrow—just as Winkle, Thompson and Sebeslav are the biggest hitmakers of today.